There are a lot of dangling plotlines on Doctor Who, going back to Matt Smith's first story. 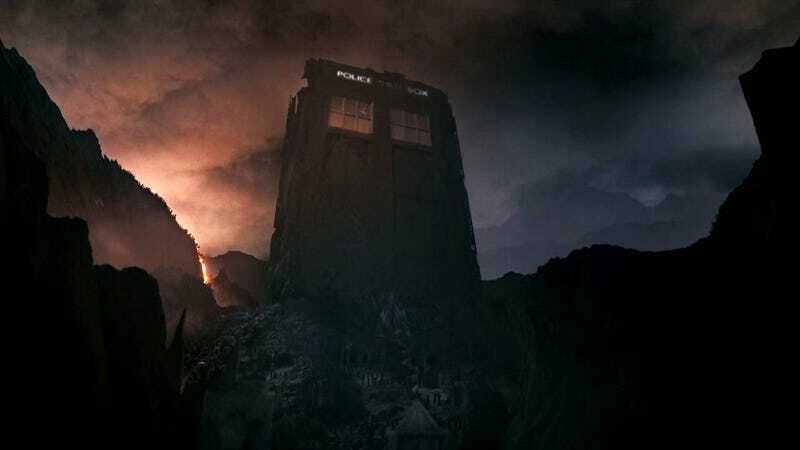 Why did the TARDIS blow up? Why were the Silence so keen to kill the Doctor before he answered the First Question? And showrunner Steven Moffat promises that everything will be explained this Christmas. When we caught up with Moffat last weekend at Comic-Con, we asked him, "Do you feel like you owe viewers some closure on the big questions, like who blew up the TARDIS? Or what the Silence was up to?" And he responded, "Well, we are going to do it all. It's going to end at Christmas. Yeah, [there will be closure]. But 'owe them'? I don't know about 'owing.' But yeah, there's a plan, and we will end the Eleventh Doctor's run with the answers to some of those questions." And what about the biggest dangling plotline in Doctor Who history? Back in 1986, the Doctor met a dark alternate future version of himself known as the Valeyard, who put him on trial and tried to steal his remaining lives. And the Valeyard was never mentioned again — until the most recent Who story, "The Name of the Doctor," when his name came up. Well, I couldn't resist saying 'The Valeyard,' because we haven't mentioned him in the new series. [Laughs] So I thought, 'I'll just put that one in.' I never quite understood, in 'Trial of a Time Lord,' what he was meant to be. I never understood if he was a real Doctor, or [something else]. But in a story where we are hinting that the Doctor has a hidden chapter to his life, it was irresistible to mention the Valeyard. But you know, he'll only ever get so dark, let's be honest. He's the Doctor. I think a man who worries about going bad is never really going to go bad. Maybe not. As for the Doctor's wife, River Song, she is not a dangling plot any longer — and in fact Moffat seems pretty happy with how he left her in "The Name of the Doctor." At this point, he seems to feel as though he's told the story he wanted to tell about her. He adds that he's "not quite sure" if we'll see her again. We could, because we're seeing her out of sequence in the past, "and clearly the implication is that she's met more than two Doctors. But the question is whether or not we should" revisit her. He adds that "it'll now be story-driven": If he has the perfect idea for a story that involves River Song, she'll be back. "But I quite liked where we got to at the end of 'The Name of the Doctor,' with him saying goodbye to her. So we'll see." I feel as if I've learned nothing. That's a despairing attitude! Because every Doctor Who episode is different. I'm writing one right now and thinking, 'Ooh. How can I have been writing this for so long, and I still don't know what's going to work?' Each script is a very different challenge, and that's probably special to Doctor Who. There isn't a paradigm episode." Every episode has to be fast, funny, emotional and inventive. "Every scene ends in a cliffhanger. Every moment is huge and powerful. That's the aim, anyway. Whether we do it all the time is another matter. He concludes: "There you go. I've learned nothing, since 2005!" Meanwhile, we asked Jenna Coleman if Clara was going to be more like a Time Lord, now that she's been inside the Doctor's timestream and seen things that even the Doctor hasn't seen. She says that Clara definitely knows the Doctor really, really well now — maybe even better than River Song does. "What's really nice, and I like, is she just knows him really well now." And she says that the relationship between the Doctor and Clara is a lot nicer now that there's no more mystery between them. So far, they've only shot the 50th anniversary special, and their dynamic seems really different without the questions about Clara being the "Impossible Girl" in the mix. Meanwhile, we asked Matt Smith how the Eleventh Doctor had been affected by meeting so many dark versions of himself, including the Dream Lord and the Cyberplanner. He responded immediately, "I loved the Dream Lord! He was a cool villain." Then he added: "One of the most interesting things about the Doctor is, if you look at the history of his life [and] the blood of his hands — think about all the empires he's had to destroy, the companions he's had to let go... and that, I think, is part of the reason why he bounces around the universe in quite an affable, silly manner. Because I think ultimately, there's so much blood on his hands, if he actually contemplated it too much, he'd be a very sad man." "It would be a very morbid show," adds Coleman. "There's a great sadness underneath him somewhere," says Smith. "But like all great people, he manages it."